1 There are 2 things you need to do to prepare this dish. First, make the Bulalo. Second, make the paksiw sauce. 2 Let’s begin by making our Bulalo. Get your pan nice and hot over medium heat and pour some oil and throw in the onion, garlic and pepper. Turn the heat up and gently add the sliced Bulalo steak and just sear or brown the meat on all sides. 3 When the meat are all brown, pour in the water and just bring this to a boil over high heat. Then, bring to a simmer and cook for 2 – 5 hours or until the meat is fork tender. 4 Now that the Bulalo is done, let’s make the paksiw sauce by pouring the lechon sauce, Knorr Beef Cubes, sugar, banana blossoms and bay leaf into the pot. Mix well to fully combine the ingredients and simmer for 10-15 minutes. 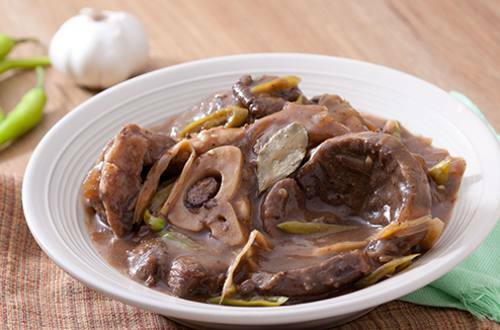 5 Wait till you see the reaction on your family’s faces when they see plated Bulalo Steak with paksiw sauce on top. They will truly thank you for it!